My hubby celebrated his birthday a couple of days back. Our 3 year old woke up in the morning -hugged, kissed & wished him. She also reminded him “Don’t forget to wear your crown”, just as he was walking out of the door for work, with no doubt in her mind that he is going through deal of crown, birthday song, cupcakes and cheers…. Now a confession… quite a few years back I had this obsession with the Pinacolada cocktail mix. No I was not pregnant. I used to have the chilled non alcoholic mix for dessert almost every single day. (That was when the health concerns do not get so intense.) I do not do that anymore, but I still love the flavor of pinacolada. The urgency & memory combined, I scurried and checked my pantry to find that I had all the ingredients I need. So pineapple coconut mousse it was going to be. Besides the cocktail, the combination of pineapple & coconut does have a refreshing tropical touch to it. Its all fruits, and no refined sugar, & a great way to entertain the kids too. One has to agree to that. Monthly Mingle:Low Sugar Treats hosted in the Daily Tiffin. Note: Do play around with the amount of honey/sugar. 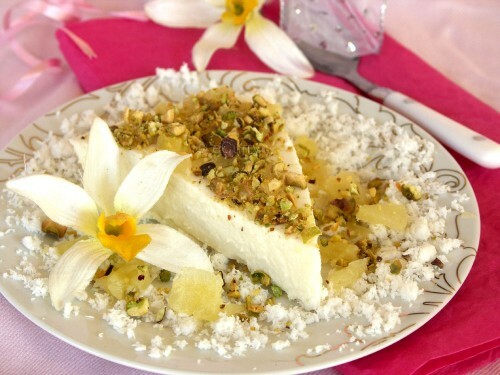 Pineapple, coconut & the coconut milk will lend their natural sweetness. Drain the pineapple & save the juice. Puree Pineapple, coconut, coconut milk & honey in a blender. Set aside. Sprinkle Gelatin in 1/4 Cup of pineapple Juice and let it sit for about 10 minutes. Heat about 1/2 cup of juice and mix in the gelatin till completely dissolved. Fold in the gelatin mix into the pureed pineapple coconut mix. Beat the chilled cream till it forms soft peaks. Fold it in the above mixture. Pour it in a dish, Cover & Refrigerate. Chill for atleast 2-3 hours. This can be made a day or two ahead. 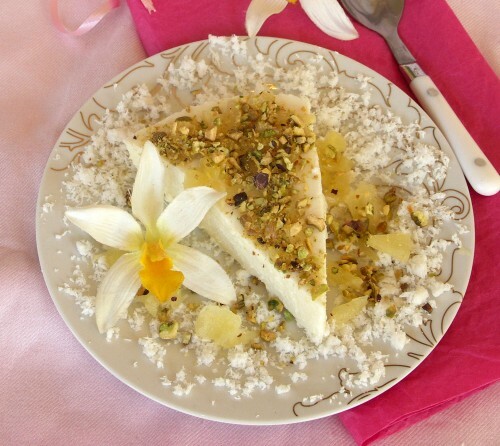 Slice it up & Serve with pineapple pieces & pistachios topped on the mousse. BTW, the first person to try this out and even asked for more helpings was my 7 year old daughter. She loved the pineapple pieces & nuts on the top & the melt in the mouth feel, and even asked me to make it again & to try out with different fruit combination. That looks angelic, with the flower, the presentation looks impeccable. gorgeous pictures Soma. u are an amazing photographer. love the decorations.. just the way i like. mousse looks great too. Oh my! This looks and sounds incredible! Just lovely and thanks for the entry! Amar oi plate ta chai Soma … noyeto at least ekta sli Flower ce? Please? 🙂 Shajeicho khub beautifully! Flower gulo ki edible? Sharmila, shob niye nao. pathiye debo? ekhane chole esho, aro bhalo hobe:-). I wish the flowers were edible. Shajeicho khub beautifully! Flower gulo ki edible? Awsome presentation Soma. What a superb recipe and I have bookmarked it for a party. Thanks Shibani!! if u make it lemme me know how it turned out. Happy Birthday to the man of your life ! This is a beautiful post !! wonderful recipie and awesome photo !! I couldnt put my eyes off this post !!! Look like a sensational piece of mousse, great tropical flavor! Very gorgeous! Thanks ! I love the tropical flavors. Soma, this is absolutely stunning!!! Thanks Jayashree! & Thanks for the award too! The presentation and the mousee looking stunning and elagant. Wow.. very Nice & innovative site.. first time here.. super recipes & all recipes are very tempting..THXS for sharing.. Pretty presentation, Soma! I love the joyous mood of the picture:) Happy birthday to your husband and hugs to the little one. I will try this dessert for the kids – they love these kinds which are semi frozen better than cakes! I like these kinda a desserts more than cakes. I still love pinacolda the alcholic version. I love this dessert. I am bookimarking it to make them. yum, makes you almost smell the tropical air! Thanks for visiting me! And I am not only a one time visitor, but will be a regular here from now on! Oh and needless to say, what a gorgeous and delectable dessert dish. Droolworthy pics. Simple ingredients delightful recipe. Thank you for sending it to FIC-White. I like the sound of a pineapple panna cotta! Great photos! 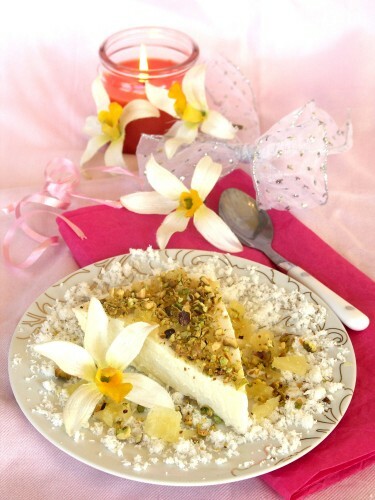 Hi – This looks wonderful.Can we substitute Agar-Agar instead of Gelatin in this recipe? Hi this is an awesome blog and this recipe looks and sounds delish! Question, however…. what do you mean when you say “Fold in the gelatin mix into the pureed pineapple coconut mix. Here is what “Fold” would mean.. “Folding” is combining one ingredient with another, very lightly to avoid loss of air. The motion consists of cutting vertically through the mixture and sliding across the bottom of the bowl and up the side and then turning over. Repeat until ingredients are mixed. Beat the Cream with a spoon(will take some time) or with an electric beater till you see the soft peaks on the surface of the cream. Fold in the cream (like explained above) with the pineapple gelatin mix. Again don’t stir.. it needs to keep the fluff of the cream.